We have a Members Show coming up at the beginning of June (for Project Gallery) & I’ve been trying to think what I could paint for it… I realised there isn’t long left to decide on a subject and get it done. The topic is My Illawarra: An Urban Landscape, which poses two challenges for me – I don’t know the Illawarra at all and I have an aversion to painting buildings & things with straight edges. 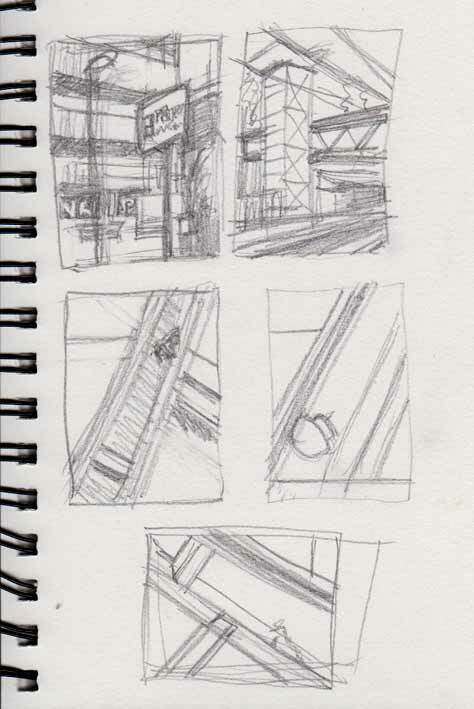 I’ve only been visiting the area since I’ve been volunteering at the Gallery and usually I’m just rushing between there and the station along a street that doesn’t have much aesthetic appeal at all. So that gives me a couple of options – paint the gallery, or paint the station 🙂 . On my last trip I took a few photos of both and today I’ve been trying to rough out some compositions… something I admit I don’t usually do (you can probably tell) because I hate doing it. I don’t know why but I really don’t like doing thumbnails or trying to think of variations, my shoulders hunch up, my knuckles go white & I don’t enjoy it at all. Even with these pictured here there’s only one version of each. Actually, I did manage three of the last idea which is a swallow in the rafters of the gallery – but I don’t think any of them worked so that one’s probably discarded. 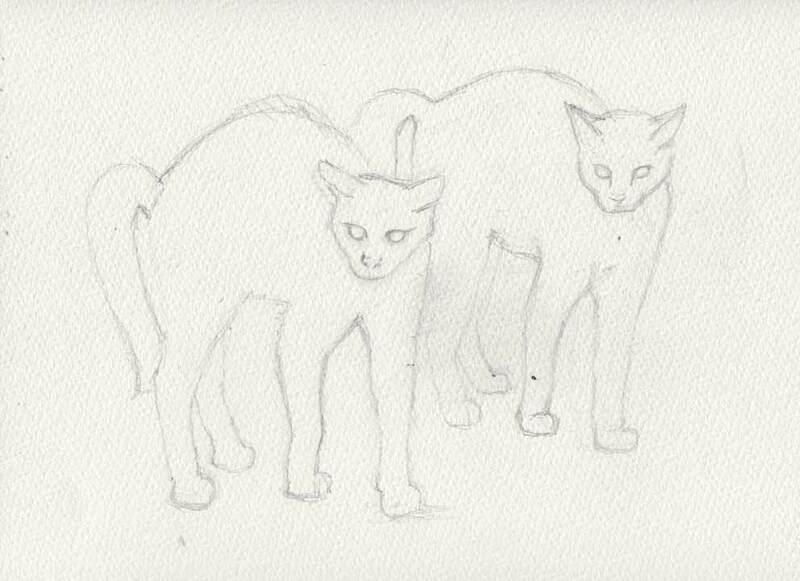 The scary cat I painted a couple of days ago was originally part of a double cat composition, taken from a photo on Paint My Photo – these two kittens are so comical, both frozen in the same pose, that they’re begging to be painted. I started this preliminary drawing yesterday afternoon but it’s taken another full session, and lots of erasing, to get both cats looking anything like real animals – they are so hard to capture! I’m still not totally happy with the outlines, but all the adjustments are ruining the paper and the freehand painting of Tuesday worked out OK in the end, so it’s time to put the pencil down and just start. Day 284: Watch the Birdie! Comments Off on Day 284: Watch the Birdie! I’ve been doing a bit more preparation for Chinese Painting Class today and have looked at some of the reading we’ve been asked to do. 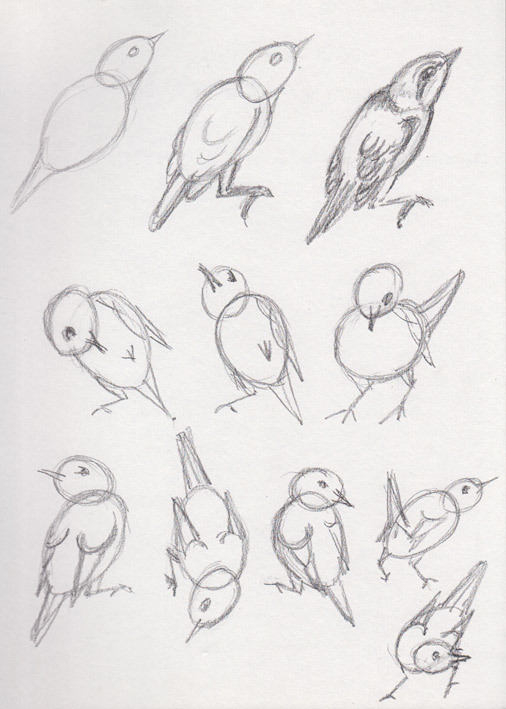 Much of this involves understanding the basic shapes of birds and their underlying anatomy. It appears they can generally be built easily from two egg shapes, one for head and one for body, so I’ve been practising a few to get the hang of a variety of different poses and positions. It certainly does make things much simpler when you have some simple rules to follow. Our last day at Kangaroo Valley and what a shocker… the wind blew, the sun got hotter and by lunchtime it was almost unbearable outside. Before lunch we went up to a local viewpoint and looked out over the whole of the South Coast, an amazing view. Then we retired to the cottage and tried to rehydrate. After lunch we were out again and began hearing news of fires around New South Wales – the hot weather and high winds are the worst combination for firefighters and tonight there are large blazes everywhere. Luckily none very close to here, but we’re watching the news and thinking of all the poor people who aren’t so lucky. 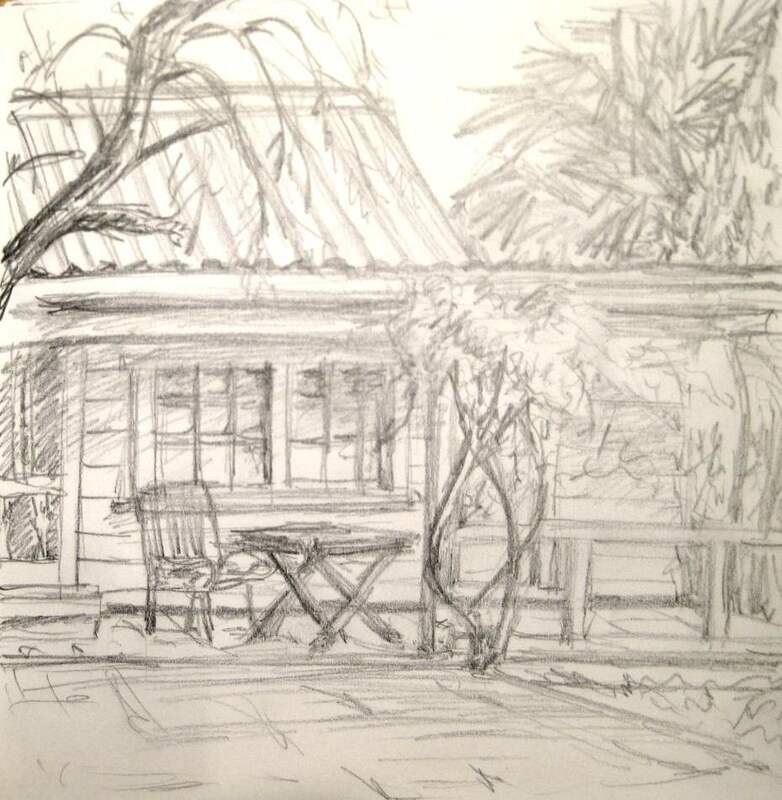 Finally, after an early evening walk for the dog, spotting kangaroos and wombats I spent half an hour in the cooling wind sketching the back of the cottage where we’ve spent so much time over the last three days. My scale is a bit off but the overall impression is there, I think. One of the most amazing places I’ve ever stayed is Hampden Cottage, an old settlers cottage near Hampden Bridge in Kangaroo Valley, New South Wales. It’s so wonderful I couldn’t let Mum & Dad leave without a visit, so we drove down yesterday and are staying here for three nights. It was built in the late 1800’s and has been tastefully renovated so you get all the Olde Worlde charm without the discomfort – it has a lovely spa bath, big comfy beds and a log fire. Not that we need the fire as the weather is beautiful. It also has lots of peace and quiet and a lovely rear garden overgrown with climbing vines and lavender, backing onto bushland. 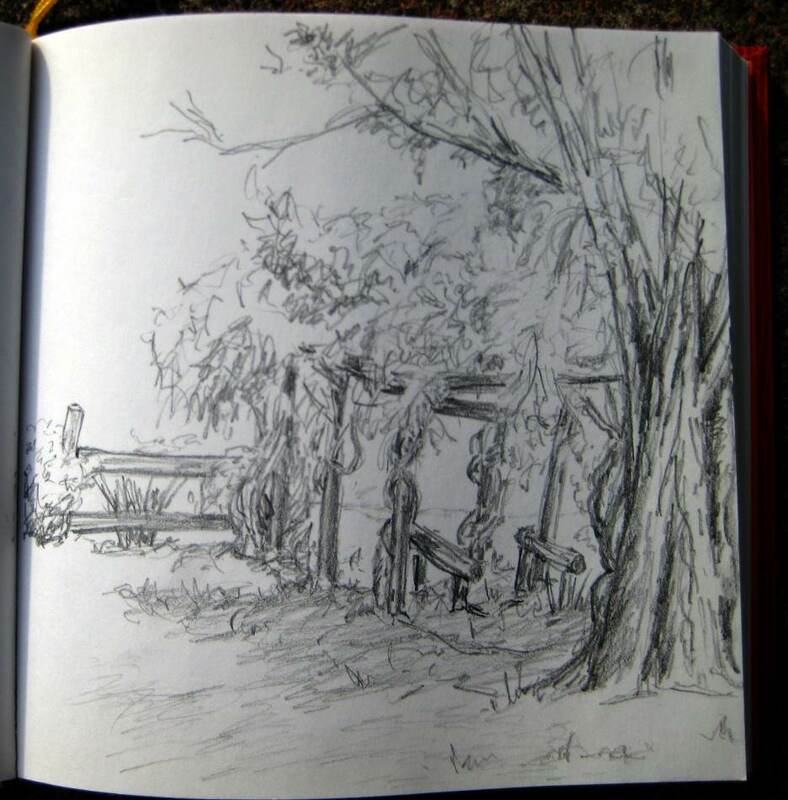 Today’s practice is a sketch of one corner of the garden which has a lean to structure completely covered in vines and leaves. I thought it would be a great challenge to sketch it, capturing the overall impression without drawing every leaf – something I would not have the patience to do anyway!